MP State Cooperative Bank Recruitment 2017 – 1634 Clerk/ Computer Operator Posts:- Madhya Pradesh State Cooperative Bank has published latest notification for filling up 1634 posts of Clerk/ Computer Operator. Desirous & eligible candidates can apply online from 01/03/2017 to 17/03/2017. Age Limit: Between 18 to 35 years as on 01/01/2017. Educational Qualification: Bachelor’s degree in any discipline from a recognized University. Knowledge of Hindi and English typing. One year Computer Diploma Course from recognized institutions. OR B.E (CSE/ I.T. )/ M.C.A./ B.C.A./ M.Sc (I.T./ C.S. )/ B.Sc (I.T./ C.S. )/ M.Tech/ M.E. (IT/ CS). Refer to notification for more details. Starting Date of Online Application :01/03/2017. Last Date of Online Application : 17/03/2017. Application Procedure: Eligible candidates may apply online through the website http://www.apexbank.in from 01/03/2017 to 17/03/2017. 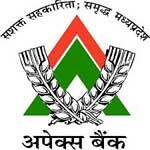 Madhya Pradesh State Cooperative Bank, M.P Rajya Sahakari Bank (Apex Bank) has published latest notification for filling up 40 posts of Banking Assistant. Desirous & eligible candidates can apply online from 28/02/2017 to 15/03/2017. Educational Qualification: Second Class Bachelor’s Degree or Master’s Degree in any discipline from a recognized University. Knowledge of Hindi and English typing. One year Computer Diploma Course from recognized institutions. OR B.E (CSE/ I.T. )/ M.C.A./ B.C.A./ M.Sc (I.T./ C.S. )/ B.Sc (I.T./ C.S. )/ M.Tech/ M.E. (IT/ CS). Refer to notification for more details. Last Date of Online Application : 15/03/2017. Application Procedure: Eligible candidates may apply online through the website http://www.apexbank.in from 28/02/2017 to 15/03/2017. Subscribe our free job alert mail for MP State Cooperative Bank Recruitment 2017.